For the obsessed, the pursuit of the subject of fascination inevitably ends in minutiae. If that subject is an author, it means that the entire bibliography has been analyzed and devoured. The secondary sources have been exhausted. The pursuit has bled over into related and tangential areas. For Burroughs that means one might have dug deeply into Scientology, Mayan history, language theory, lemurs, or pirates. Slowly but surely nothing remains to be examined. But for those truly under Burroughs’ spell, there always remains more to explore. As Eric Shoaf has shown, new items can be uncovered for the bibliography. These scraps must be obtained and processed. For the obsessed, there is great significance placed in detritus. Pieces of bone, scraps of cloth, shards of wood, a yellowed sheet of paper. These fragments contain the truth. Juvenilia are a prime example of minutiae. They sit among letters, photographs, and aborted drafts of master works awaiting their time to see the light of day. As Burroughs fans know, letters and the like hold the key to unlocking the mysteries of the man’s creative process. So it is with great anticipation that the faithful awaited publication of And the Hippos Were Boiled in their Tanks. It is strange to think of the writing of a thirty year old man as juvenilia but that is how I view Hippos. It is the work of a writer in an early stage of development — in writing terms, a work of adolescence. For Kerouac, Hippos sits on the same shelf with Atop an Underwood, Orpheus Emerging as well as the other 1,000,000 words he wrote by his early twenties. Hippos belongs with Burroughs’ early efforts “Autobiography of a Wolf” or “Twilight’s Last Gleaming.” Like Charles Bukowski, Burroughs reached his maturity as a writer later in life. Junkie, published when Burroughs was nearly forty, is his first mature work and contains many of the major themes of his oeuvre. The fact that Hippos is a collaboration is key. The partnership with Kerouac began a method of composition that would fuel Burroughs’ creative fire for the rest of his life. Kerouac deserves to be placed next to Ginsberg and Brion Gysin in terms of importance as an influence for Burroughs. This goes far beyond the fact that Kerouac titled Naked Lunch. Kerouac provided a model of the writer at work. The struggling writer facing the typewriter day after day replaced boyhood dreams of an opium addicted pretender lounging in luxury. Burroughs acknowledged as much in the essay “Remembering Kerouac.” Burroughs stressed that the most admirable thing about Kerouac was that he was a writer, i.e., he wrote. Kerouac also provided encouragement and criticism, but most important was his model of discipline. Hippos in its structure and method of composition highlights Kerouac’s influence and importance in Burroughs’ development as a writer, not so much on the level of style but on the level of providing an example of the writer at work. Hippos should put to rest (if Oliver Harris has not done so already) the myth that Burroughs felt compelled to become a writer as a result of the death of Joan Vollmer. Long before that tragic night in Mexico, Burroughs was possessed by the Ugly Spirit, i.e., the compulsion to write and express himself. Like Kerouac, Burroughs was a born writer, and Hippos shows his obsession with and deep knowledge of literature and the writing life. The comments on the forum mention Dennison’s interest in Rimbaud as poet and persona, and all the male characters in Hippos are overcome with the fantasy of living the life of the artist. The murder of Kammerer destroyed Lucien Carr’s dreams of becoming a poet as it gave birth to three other writers. Citing the Surrealist, Dada, and proto-Surrealist texts that formed the philosophy of the early Beats, it could be argued that killing Kammerer was Carr’s most inspired and most terrible poetic act. Readers will no doubt see connections in Hippos to Burroughs’ later works. The RealityStudio forum has a thread that does just that. A review in the Observer pointed out the scene where Dennison shoots up as a precursor to Junkie. More interesting to me is how we leave Dennison. He is waiting to hear about a shipment of stolen goods obtained from a shipyard. It was just such a shipment that introduced Burroughs to the world of drugs when he obtained some cartons of morphine along with some hot weapons. This led to Burroughs’ meeting with Herbert Huncke and his initiation into the drug underworld. In his afterword, Grauerholz suggested that Burroughs was introduced to the needle after the events depicted in Hippos. If that is the case, Burroughs wrote his experiences with Huncke and heroin back into the Carr-Kammerer story. The genesis of Queer resides in Hippos as well. Burroughs must have seen how the relationship of Carr and Kammerer mirrored his relationship with Lewis Marker. Nearly a decade later, Burroughs would replay the events in Hippos for himself complete with a murder that provided a shocking twist a la Law and Order. Burroughs was no stranger to sexual obsession. In the late 1930s, his feelings for Jack Anderson lead to a Van Gogh trip resulting in the cutting off of a finger. This early experience made Burroughs uniquely qualified to understand and to humanize a figure like Kammerer. Other reviewers have categorized Hippos as a period piece, arguing that the book provides a unique perspective on the world of the post-WWII hipster at the time and place of his birth — the rain-washed streets, the seedy bars, the cramped apartments, the corner restaurants. More than Junkie, Hippos reads like a noir novel. Dennison works as a private eye. 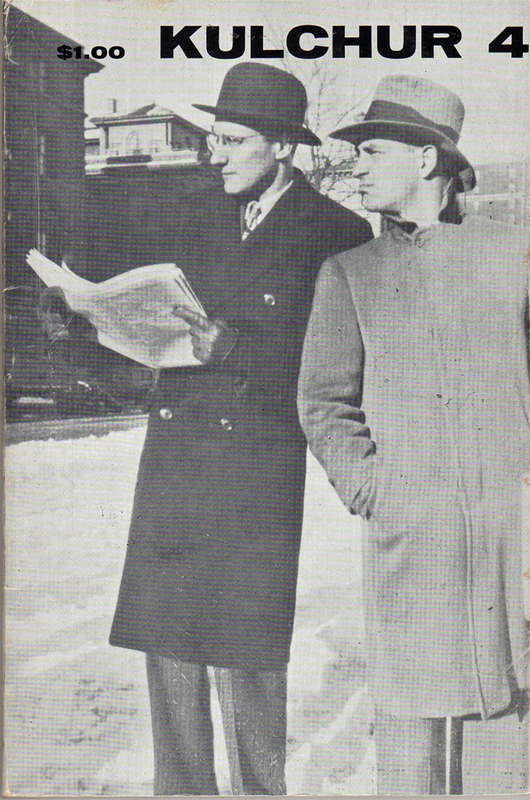 The cover of Kulchur 4 features a picture of Burroughs and Kerouac from the time of their collaboration in Hippos. They are dressed the part of the noir detective and the caption for the photo names them as Inspector Maiget and Sam Spade. I am tempted to see Hippos less as a noir novel than as a memoir like Anatole Broyard’s Kafka Was the Rage or Edie Parker-Kerouac’s You’ll Be Okay. If these books explored the same geography years later, Charles Henri Ford and Parker Tyler’s novel The Young and Evil (1933 by Obelisk Press) provided Kerouac and Burroughs with a model in terms of subject matter, method of composition (a collaboration), and atmosphere a full decade earlier. These books also capture the New York hipster scene described in Hippos. Although an act of misreading, I first approached Hippos as memoir more than novel because so much of the material from Hippos had been cannibalized for the biographical record. You finish Hippos with a sense of déjà vu since in a way you have read it all before in the Literary Outlaw and elsewhere. I see Kerouac’s Vanity of Dulouz in a similar manner. As a result, reviewers of Hippos have treated the book as a straight telling of the Carr-Kammerer story, more period memoir than novel. This is a dangerous practice. If we think of Hippos in terms of memoir, we have to be acutely aware of what is missing. Hippos purports to be a factual accounting of the murder but it is in effect a cover-up. What is missing is the star witness in the case: Allen Ginsberg. In the afterword, Grauerholz states that reader will have a good time trying to place the characters with real people. Besides the main quartet, side players include Edie Parker, Celine Young, and John Kingsland. But where is Ginsberg? As Ginsberg’s journal of the period, The Journal of Martyrdom and Artifice, makes clear he was an intimate on the scene. Included in that journal was Ginsberg’s own novel based on the Kammerer-Carr murder entitled The Bloodsong. This passionate proto-novel was suppressed by Columbia University to prevent any additional bad publicity from infecting the college. Ginsberg was bad press. Kerouac and Burroughs erased Ginsberg from Hippos for exactly the same reason. As Grauerholz mentions in the afterword, Ginsberg had a sexual relationship with both Kammerer and Carr. Ginsberg was exhibit A for the homosexual obsession that bound the entire New Vision circle. If Ginsberg’s story as told in his journal and The Bloodsong would have gotten out, Ginsberg would have been the star witness for the prosecution, and Carr might have gotten the electric chair. We can understand Ginsberg’s terror in 1948 when his notebooks were seized by police. The hot goods in the car were not the stolen furs and coats but the details of sexual obsession, murder and madness recorded in the journals. A close reading of Chapter 17 proves very interesting in light of Hippos’ complex relationship with and treatment of homosexual obsession. Kerouac wrote this chapter, and it is full of the literary flourishes and symbolism that would weigh down his first published novel: The Town and the City. There are references to Saroyan and T.S Eliot as well as to foreign movies and popular music of the time. Kerouac and Carr talk repeatedly of writing poetry. No other chapter in the novel reveals so clearly the literary aspirations of the early Beat circle. Among the movies playing as Philip Tourian and Mike Ryko walk through the city is Port of Shadows. This French classic about a deserter from the French Army references the recent trials and travails of the pair getting a ship. Kerouac later writes that Philip reminds him of Boldieu and his white gloves in La Grande Illusion. Both these movies reflect the realism and sense of impeding tragedy that Burroughs and Kerouac attempt to capture in Hippos. Yet the movie references can also be read as comment on homosexual obsession. 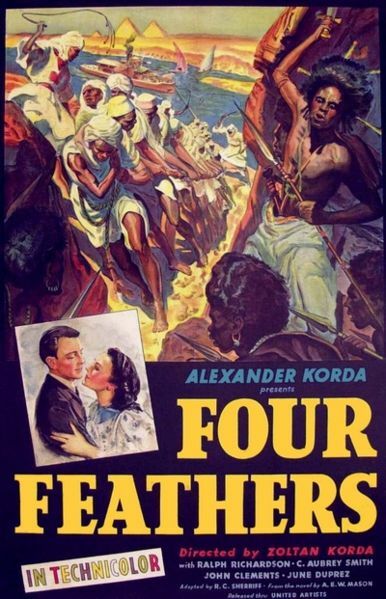 Tourian and Ryko see Korda’s Four Feathers on their way to the Museum of Modern Art. Kerouac writes, “There was an ambush scene where you saw British soldiers and Fuzzy Wuzzies hacking away at each other with sabers and knives and much blood. Most of the picture kept reminding us of Al lying in the yard in a pool of blood, so we couldn’t enjoy it that much. And one of the characters in the story was named Dennison.” This movie depicting combat with a threatening racial Other draws parallels with Tourian’s sacrifice of the dangerous sexual Other in the form of Al. The taint of homosexuality must be exorcised. After seeing this disturbing film, the pair retreats to the Museum of Modern Art. Tourian and Ryko seek solace in culture in order to get away from the anarchy of barrooms and darkened alleyways of the City. What they see at the Museum instead are examples of the culture that was the seeds of their destruction. They stop to examine a portrait of Jean Cocteau by Modigliani. The decadence, bisexuality, effeminacy and drug use that fascinated the early Beats is represented by the figure of Cocteau. The portrait was painted in 1916 and two years later Cocteau would meet the 15-year old poet Raymond Radiguet. Cocteau denied there was a sexual aspect to this relationship but rumors hounded the pair. The relationship of Cocteau / Radiguet mirrors that of Verlaine / Rimbaud and of course Kammerer / Carr. Radiguet died young leaving Cocteau distraught. Cocteau turned to opium. Of course, Verlaine shot Rimbaud. Carr provided an ironic twist to this tragic history of literary obsession, by killing his pursuer. European culture, particularly French culture as represented by Cocteau, filtered through Rimbaud, Gide, the surrealists and others would prove irresistible to the early Beats. Ryko and Tourian study Peter (?) Blume’s analyses of the decline and fall of the West as well. The reference suggests to the reader Oswald Spengler’s Decline of the West, a key philosophical text of Tourian / Carr’s New Vision. Given the existential and surrealist underpinnings of the early Beats, the murder of Al / Kammerer can be viewed as less of an honor killing and more of a violent act gratuite. Ur-surrealist Vache’s fantasy of shooting into a crowd would be the precedent. Tourian’s murder of Al can also be viewed as an assisted suicide/sacrifice of a tortured soul. Ryko and Tourian finish their tour of the Museum by viewing Tchelitchew’s Cache-Cache (Hide and Seek). At that moment, Kerouac writes, “There was a tall blond fag, wearing a striped polo shirt and tan slacks, who kept looking at Phil out of the corner of his eye. Even when we went downstairs to see the one-hour movie, the fag was sitting behind us.” Obviously the fag plays hide and seek with Ryko and Tourian as he tails and shadows the pair. But the blond man also symbolizes the ghost of homosexual obsession that haunts and follows Ryko and Tourian threatening to queer the honor killing defense. Clearly, this doppelganger is on one level Al / Kammerer, but I would suggest that it is more appropriate to view the blond fag as the specter of Ginsberg that hangs at the edges of the entire text and demands to be acknowledged. Ginsberg’s membership in Carr circle and his sexual relationship with Carr and Kammerer endangered Carr’s defense and threatened his life. Kerouac performs a game of hide and seek with Ginsberg by suggesting his presence all the while excluding him as a character in Hippos. The women in the story were meant to serve as key witnesses for the defense. These heterosexual relationships protect the early Beats against the charge of homosexuality. In the actual Carr investigation, Celine Young testified that Carr was straight and offered their sexual relationship as proof. Yet in Hippos, the female characters are aware of their outsider status in the boys’ club and realize they are in some ways being used as beards. Barbara and Janie repeatedly accuse Ryko and Tourian of being fags throughout the novel. Given Carr’s intended defense, being accused of homosexuality was a matter of life and death. Homosexuality and homosexual obsession in Hippos are centered on the character of Kammerer and deflected from the other characters. This is most striking in the depiction of Dennison. Dennison is portrayed as straight. He has a wife and has sexual relationships with women in New York. In a scene that shocked me, Dennison feels up a woman’s thigh in an apartment. In order for the honor-slaying defense to be believed, the bisexuality of the New Vision circle had to be suppressed. Yet Burroughs’ true feelings on the subject of women slip out. Dennison’s wife is strategically placed in Colorado. She is a shadowy figure at best. One wonders if she exists or is a cover story. In a statement similar to Burroughs at his most misogynistic in The Job, Dennison punningly states, “Al’s right, my boy… Women, Philip, are the route of all evil.” This line reminded me powerfully of Naked Lunch. It is an act of ventriloquism. Dennison distances himself from homosexuality by speaking through Al. In addition, Dennison speaks Al’s words in a “Lionel Barrymore tone of voice.” Barrymore was famous for his booming voice as well as being a womanizer and ladies’ man. More ventriloquism; more deferral. Just before Dennison echoes Al’s thoughts on women, Burroughs as Dennison writes, “Yeah, I said to myself, why can’t we do away with women altogether.” The emphasis is Burroughs’, and it is the key question of the entire novel. The answer is simple: to do so would mean to admit to and make obvious the presence of homosexual obsession within the entire group including Carr. This could result in persecution by society leading ultimately to the death penalty for Carr. Interestingly, Burroughs poses this question in silence to himself. In an age of extreme discrimination against homosexuals, silence was a key defense against prosecution. Don’t ask, don’t tell. Silence coupled with invisibility. As a result, the key witness and chronicler of homosexual obsession in the group, Ginsberg, is gagged and hidden safely away in the margins and afterwords of the text. Not just Carr’s but all the early Beats’ survival depended on it. Written by Jed Birmingham and published by RealityStudio on 5 November 2008. Very fine assessment and analysis. I particularly agree with your points about collaboration and the mythology around the Joan Vollmer homicide. Your scholarship, as usual, proves to be invaluable. Thank you for the excellent insights. When in Rome, do as Romans do? I once wrote an essay that I sent to Harris in which I mentioned that he had made a mistake in his lecture in Mexico because Burroughs had started writing since he was in the States. The argument I gave him was quite similar to some of your interesting reflections here: Hippos was written in the US and was originally intended to be published, that is to say, Burroughs aspirated to be a published writer long time before the shooting of Vollmer. Not that I am claiming any originality as to my argument, anyone acquainted with the chronology of Burroughs publications can notice this detail, which of course was not my case because if my memory serves well when I wrote the essay I thought Hippos had been written in 1948.
â€œHow differently might Burroughs’ life have unfolded then! If he had been deported to the U.S., or imprisoned, he would not have remained through all of 1952 residing at 210 Orizaba in Mexico City, where he was writing the final drafts of Junkie and the unfinished Queer manuscript; and his second South American trip, with the apparently life-transforming experience of taking the hallucinogenic yagé in 1953, would never have occurred. Your comments on the way in which silence was of extreme importance to the whole history and development of the Beat generation are, at least to my taste, excellent. Personally I think we should feel happy because times have changed and nowadays one cannot, must not, be silent. Any government or institutional instance that represses sexual preference of any type must be denounced, whether it is republican or democrat, whether it is headed by a white or a black man. 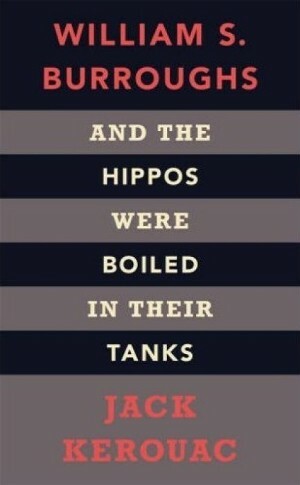 quite simply the most satisfying and depthful review of ‘and the hippos were boiled in their tanks’ i’ve yet read. thank you, jed. I am currently reading A Boatload of Madmen, a book about Surrealism in America from 1920-1950. 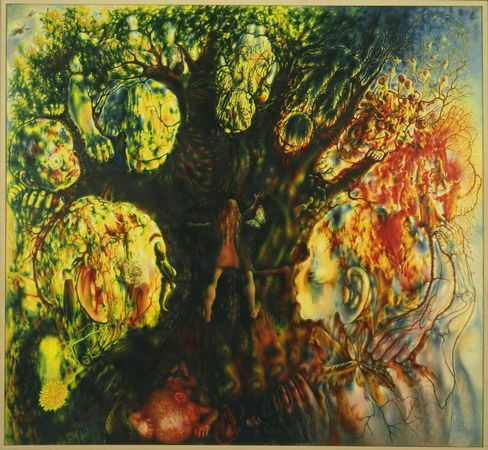 Charles Henri Ford figures prominently given his close relationship with the Surrealists probably best demonstrated in his role in editing View. Ford wrote Young and Evil with Parket Tyler in the early 1930’s and the book has many similarities with Hippos. Chapter 17 has a nod to Ford and thus The Young and the Evil. Ryko and Tourian view Tchelitchew’s Hide and Seek at the museum. In Boatload of Madmen I read that Ford was the companion of Tchelitchew and promoted his artwork throughout the late 1930’s and 1940’s to Breton for example. So in referencing Hide and Seek Kerouac tips his hat to The Young and the Evil as well as another famous homosexual relationship in the arts. Thanks for the insightful commentary. The story does indeed illustrate the value of Burroughs’ early collaboration, similar to the Burroughs/Elvins “Twilight’s Last Gleamings” opus. I would be interested to know why Burroughs apparently was not interested in publishing this later in his career, as he did with “Twilight’s Last.” Perhaps he saw it as comparatively weak or too raw. In short, Burroughs writing frequently confronts manifestations of the US. I think by doing so he has a better chance of avoiding its influence, making the enemy visible, as it were. that is what he said about his complete will to write, and the big crisis in Tangeri led him to fully recognize his writer powers.